Home/Phoenix Computer Repair Blog/Calling Technical Support From A Search On The Internet? If you are calling technical support from a search on the Internet for a problem you need help with, please be very cautious. Recently, someone I know (let’s call him Sam) attempted to resolve an issue with his email on his iPhone and ended up calling what he thought was Apple Technical Support. What he ended up with was a disaster on his computer. How does this happen when calling Apple Technical Support for a cell phone email issue? To begin with, Sam changed the password for his email from his computer. Then he attempted to connect to his email with his iPhone and could not. After several attempts, he decided to call Apple for some help. 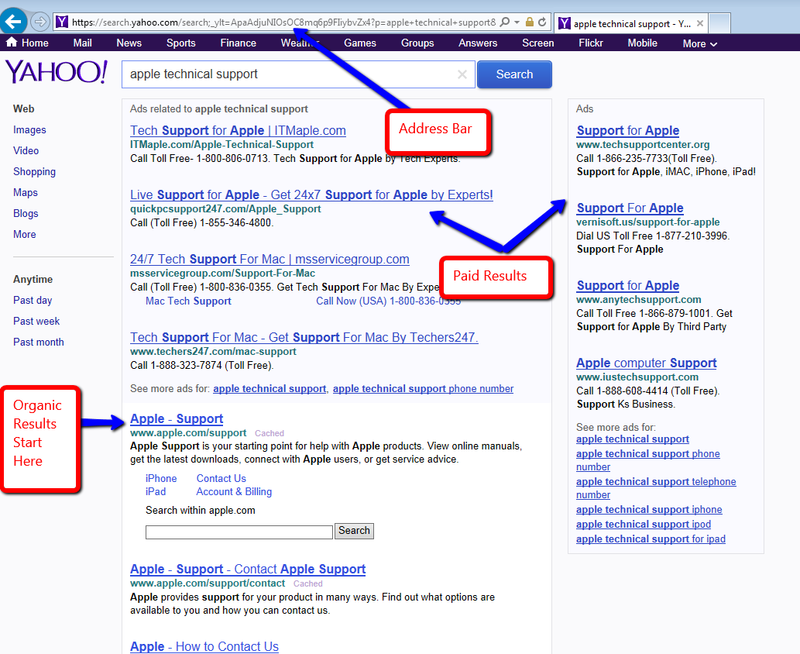 He searched for the term “Apple Technical Support” on Yahoo Search and ended up calling one of the paid advertisements, which are in a colored background and are located above the real search results (also known as organic search results – see picture below). That is when his very big headache began. The ‘technician’ told Sam that he needed to get into his computer to find out what the problem was. Really. He needed to get into his computer to resolve an email issue on his phone? That should have been a red flag but Sam trusted the ‘technician,’ and thinking he was really calling Apple Technical Support, he obliged and let him take control of the computer. The ‘technician’ then fiddled around inside the computer, right in front of Sam’s eyes, and told him that his computer network was messed up and he needed $700 worth of work to ‘fix’ it. Yes, seven hundred dollars. The conversation continued for several minutes during which time the ‘technician’ really did something to mess up the computer while they were talking. Sam finally hung up on him because he realized that there was no possible way that, since his computer and his network were working properly prior to the call and the equipment was all relatively new, there was no way his system needed that much work. Yes, this was a scam. Almost a perfect scam at that. Sam trusted that this ‘company’ would do right by him because he really thought he was calling Apple. He obviously was not, but he was not aware of this at the beginning of the call. The ‘technician’ did not break this trust until the end of the call when he wanted an outrageous amount of money to fix a problem that didn’t even exist. All of this would have turned out okay except for the fact that the computer no longer operated correctly at the end of the call. The ‘technician’ was not that in any sense of the word – he was an experienced salesperson in a foreign country (probably India) and he had Sam eating out of his hand, at least until he quoted the ridiculously high price to ‘fix’ it. The real problem that the computer ended up with after the call was generated while the ‘technician’ had Sam confused about the issue. This is part of the scam. If you ever need any kind of help with any equipment and you want to search for that help on the Internet, try to find a local company to help you. A local company lives in the same area you do and is much less likely to be a scam artist. Also, the money you spend tends to stay local, helping your local economy. If you are searching for free technical support (for your phone for example) and you are looking for a specific manufacturer, verify the link on the search page is actually the domain of the manufacturer. Only let someone into your computer remotely if you really are having a computer problem and verify they only address that specific problem. The real technical support department from the manufacturer is not going to tell you your computer is sending viruses out to the Internet or has major problems and you need to pay money to fix it. We all need help with our devices and machines sometimes. However, it can be a dangerous world out there if we are not careful about who we choose to help us. Hopefully this article enlightens you on how to make a good choice when you do need help. Thank you for reading.